Your opinion matters. Leave A Review Or Edit This Listing for Neighbors Helping Neighbors. Neighbors Helping Neighbors is part of a wider effort to combat food insecurity - lack of access to enough food for an active, healthy life. Our 75 volunteers are committed to that cause. It all began in 2010 when the United Methodist Church's mission committee was looking for a way to serve the community, and members learned that food was the greatest need. 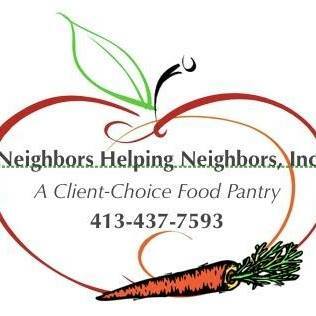 Please consider supporting Neighbors Helping Neighbors by making a monetary contribution (checks made payable to Neighbors Helping Neighbors, Inc. and mailed to: NHN, 30 Carew St. South Hadley, MA 01075), donating canned/non-perishable goods and/or volunteering your time. NHN is a 501(c)(3) charitable organization and all donations, financial or otherwise, are tax-deductible to the extent allowed by law. We always need more information on our pantries. If you know of any details, volunteer information, website, hours or more description information about Neighbors Helping Neighbors please add a comment (below the map on this page), with information. We will then display this for all visitors on this page.